• Habitat Features Include: 2 Story, 12 Room House; Easy Snap Assembly and Easy Access For Cleaning. 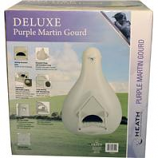 • Ventilated To Provide A Cool Nesting Area; Drain Holes Allowmoisture To Escape, and Guard Rails To Protect Young Martins. • U. V. Fade Resistant. • Compatible With Both The Model# Mp-15 Martin House Pole and The Model# Pmp-15 Martin House Pole (Sold Separately). Stainless steel. Multi use. Holds Approximately 1/4 cup. . .
Attract a variety of birds!. Seed cakes not included. Holds up to 5 stack'ms. . . Stainless steel. Hold approximately 1 cup. Multi use. . . Stainless steel. Multi use. Hold approximately 1/3 cup. . .
Starling resistant entry. Front porch with inside landing. Elongated shape with extended facing. Purple martins seek out man made habitat exclusively for colonization. .
• To Feed Wild Birds, Especially Woodpeckers. 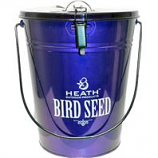 • A Quick Source Of High Energy For Your Backyard Birds, Which Have A Very High Metabolism. • Use Year Round For Healthy Feathers. • Guaranteed Not To Turn Rancid. • Highest Quality Beef Tallow Means A Higher Melt Point For Year Round Feeding. • Attracts Chickadees, Finches, Cardinals, Woodpeckers and Other Colorful Songbirds. Holds up to 4 stack'ms. Easy fill design. Attracts both clinging and perching birds. Durable stack construction. .
• Charming Abode For Purple Martins. • Constructed Of Cedar Due To Its Durability, Longevity and Insect Repelling Capacity. • Easy Opening For Monitoring and Nest Removal. • Heath Martin House Pole Recommended Due To The Weight Of This House. • Blended Suet, Seed and Natural Orange Flavoring. Highest Quality Beef Tallow Means A Higher Melt Point For Year Round Feeding. 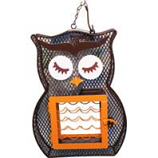 Holds sunflower seeds or peanuts along with 2 standard sized suet cakes or small seed cakes. Full surface feeding area. Twist lock top opens for refilling. . .
• Soon Enough You Will Charge The Birds Rent To Stay At The Deluxe Apartment House In Your Backyard. • Have Fun Watching The Birds That Take Occupancy Over Time. • Includes Porch Rails and Door Stops. • Floor Snaps Out For Easy Cleaning. 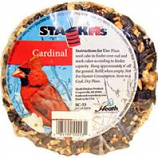 • This Songbird Suet Cakes Are The Same High Quality In A Smaller Size and Price. • With Their Timeless Appearance, Tube Feeders Are Among The Most Popular Series Of Feeders Sold. 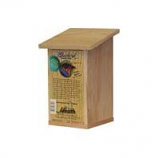 • Multiple Feeding Stations Attract Many Birds In A Minimum Of Space. • For Use With Nyjer Thistle Seed To Attract All Types Of Finches. 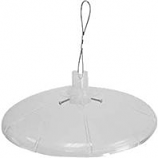 • Completely Clear See-Thru Tube, Wooden Perches, Plastic Top and Metal Hanger. 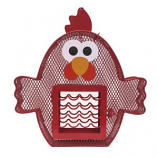 • Priced To Be A Perfect Starter Feeder. • Easy Clean 2 Piece Design. 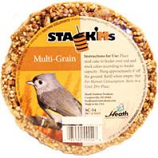 • This Super Premium Suet Cakes For The Most Activity At Your Feeder. • Blended Suet and Peanut Parts Give Added Protein. • Attracts Suet and Fruit Eating Birds. • A Quick Source Of High Energy For Your Backyard Birds. • An Excellent Cold Weather Substitute For Insects On Which Birds Usually Feed. • Unattractive To Squirrels, Better Bird Activity. • Attract Colorful Songbirds and Deter Squirrels With This Year Round Songbird Suet Cake. • Laced With Hot Peppers That Birds Cannot Taste But Drives Squirrels Elsewhere For Food. • A No Melt Blend Of Suet, Grains & Apple Flavoring. Powder-coated metal bird feeder has a locking lid. 12 feeding perches. . . . Holds up to 15lb of mixed seed. Keeps seed fresh. Locking top keeps squirrels and other animals out. 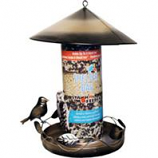 Durable steel construction. .
Stop squirrels from feeding at your bird feeder. 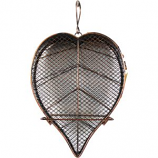 Works with hanging or pole-mounted bird feeders. Stays clear! Made of high strength polycarbonate plastic. 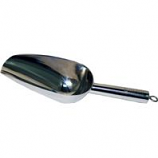 . .
• Easy To Use- Allows You To Scoop and Fill With Just One Hand! 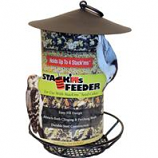 • Premium Quality Woodpecker Suet Feeder Holds Two Cakes. • Double Basket Allows Woodpeckers To Feed From Either Side. 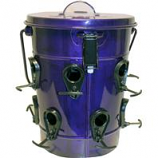 • Specially Designed For Woodpeckers, This Feeder Offers A Tail Stabilizer For Easy Feeding. 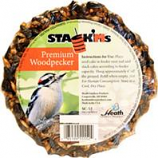 • For Best Results, Use With Heath Premium Woodpecker Blend Suet! • Comes In Self Display Shelf Carton. Premium bluebird house manufactured with heavy-duty cedar lumber for superior weather resistance.. Side tilts out for inspection and cleaning.. Designed to specifically attract bluebirds with a 1.5 inch entrance hole.. Mount the house 5-6 feet above the ground on a pole and ensure that the entrance hole does not face the direction of storms.. Spacing the houses 200 feet apart will prevent any territorial conflict.. 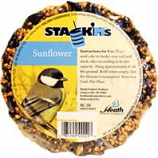 Hold sunflower seeds or peanuts along with 2 standard-sized suet cakes or small seed cakes. Full-surface feeding area. Twist-lock top opens for refilling. . . Helps protect against squirrels. CLear plastic tube that does not cloud over time. Birds can feed from all sides. Weather resistant. . Attracts many different birds to one feeder. Mix up the ideal combination of flavors for your needs. Will have beautiful birds coming back to your yard. . .
• Protective Cage Keeps The Squirrels Out! • Beautiful Cedar, Chalet-Style Wren Home With 1 Inch Diameter Entrance Hole. • Bottom Slides Out For Easy Cleaning. • Enjoy Watching These Beautiful Birds In Your Backyard By Hanging This House 6-10 Feet Above The Ground. • Try Hanging Several Houses In Your Backyard To Create Your Own Backyard Habitat.